Sadly, I missed this year’s Penny Arcade Expo in Seattle, Washington. To numb the pain of my absence, I followed the news regarding the massive amounts of content available at PAX. One game that caught my eye was Chris Hecker’s Spy Party, a competitive game between two people: the first a party goer amongst a room full of AI characters tasked with accomplishing three tasks, the second a sniper searching for tells that would reveal the human player as the spy. Despite never actually playing it myself, I dreamed about this game - twice. The idea of pretending to be a computer-controlled character struck me as incredibly appealing. 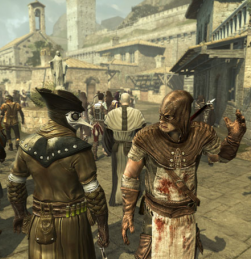 With a very similar mechanic, the multiplayer for the newly released Assassin’s Creed: Brotherhood is a startlingly success. The four multiplayer modes of Brotherhood are essentially slight iterations on the same basic premise. In Wanted, the free-for-all mode, each player has a unique avatar to differentiate them from the other players. The map is then randomly populated with exact copies of the player avatars. Players are then given a single target to assassinate. Using a form of radar that points to the general vicinity of your target, you must stalk other players and try to discern them from a crowd of clones. 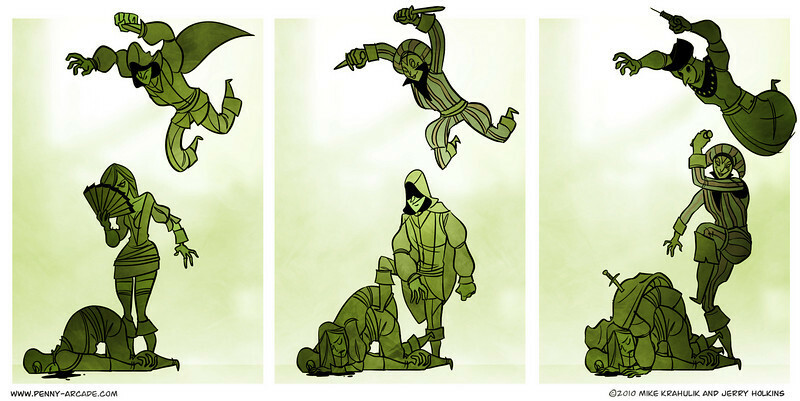 All the while, you too are being pursued by other assassin’s, sometimes up to four. The result is a thrilling blend of ‘hide & go seek’ and ‘tag’ that reproduces that sensation I imagine both predators and prey feel during a hunt. Brotherhood rewards points to players based on escape and types of kills and punishes players for killing civilians. 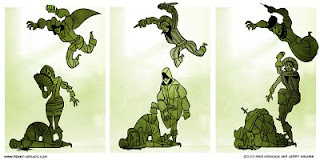 These rewards are significant and greatly incentivize sneaky assassinations - although subtly is not always an option. One particularly challenging reward requires the hunter to be very near her prey for more than three seconds before dealing the fatal blow. Since other players can stun pursuers, accomplishing such a task demands expert patience and nerves of steel. The game evokes unmatched sensations of paranoia as well. Did you catch strange movement from that barber? Could he be trying to kill you? What that a flash of steel from the roof top? Maybe it's just another player chasing a different person. Even choosing when to assassinate or chase your target is a significant decision - you may inadvertently reveal yourself to your pursuer as well. It is not uncommon to see a series of assassinations take place on the same patch of bloodied soil. Successfully incorporating platforming into a tight multiplayer experience is a success in itself. Verticality is an advantage and disadvantage when on the prowl. Rooftops give you an eagle-eye view of the landscape, but also make you an easy target to spot. Maneuvering the roof tops becomes even more exhilarating when chasing or fleeing another player. Leaping off balconies and scaling towers to outrun an opponent is as riveting as any major movie chase scene. In fact, barreling through crowds of people while tracking another player running on a roof top reminds me of the early chase scene in Casino Royal, the James Bond film starring Daniel Craig, which is hands down one of the best foot chase scenes in cinema. The transition from stalking to racing and vice versa is fluid and effortless. Many of Brotherhood’s mechanics have more impact in multiplayer than in Assassin's Creed II’s singleplayer. Smoke bombs, instead of unnecessary diversions, are valuable albeit risky tools that can buy you precious seconds to escape a group of assassins. Shooting an opponent off a rooftop ledge with a pistol is a far more significant option when it means you do not have to risk blowing your cover. Even the kill animations are more than normal visual treats: they are exploitable mechanics. While one assassin takes out your teammate with a flurry of swords, the animation might just be long enough to stun them and get revenge. Yet then you would commit yourself to your own animation, revealing your identity and increasing your vulnerability to attack. I usually play the singleplayer segments of games before moving on to multiplayer, but the call of the hunt is too powerful. Brotherhood and Spy Party both mark a significant and incredibly interesting design path, one that encourages us to blur the lines between player and computer. Rather than trying to push the technological barriers between ourselves and truly artificial intelligence, they exploit tech limitations and our familiarity with computer behavior. I cannot help but feel this opens up the door for more imaginative games that change how we relate to the digital worlds we inhabit. Yep, I've been extremely satisfied with the AC:B multiplayer myself. We should play sometime! I'm such a sucker for any game about deception. Normally games (esp. board/card games) about deception do so with direct social interaction. AC:B and Spy Party are interesting because that deception is essentially mediated by the game and its AI NPCs. It's fascinating and only really possible in a digital game. Oh, the possibilities. You playing it on 360 or PS3? Because if you're on 360, I'm so up for stabbing.